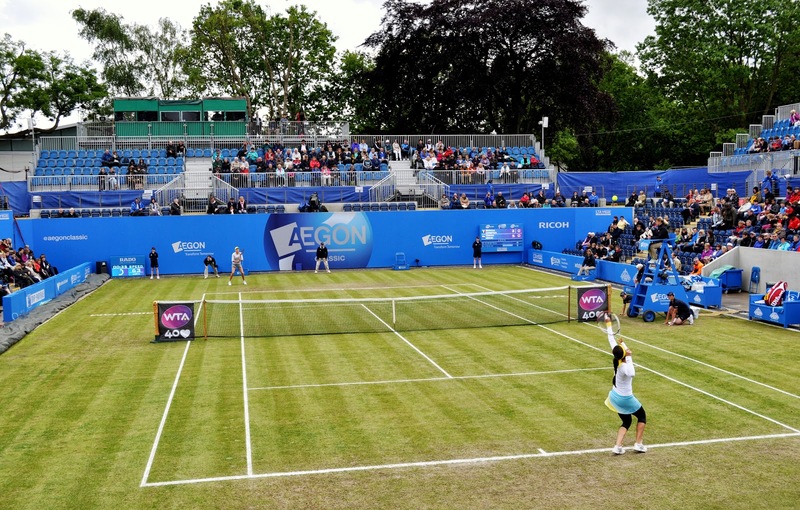 After I got pretty much rained off last year at the AEGON Classic in Birmingham, I decided it was worth giving it another go this year plus I wanted to see the new Centre Court. I bought tickets for the quarter-finals and overall it was a fun, yet damp day! 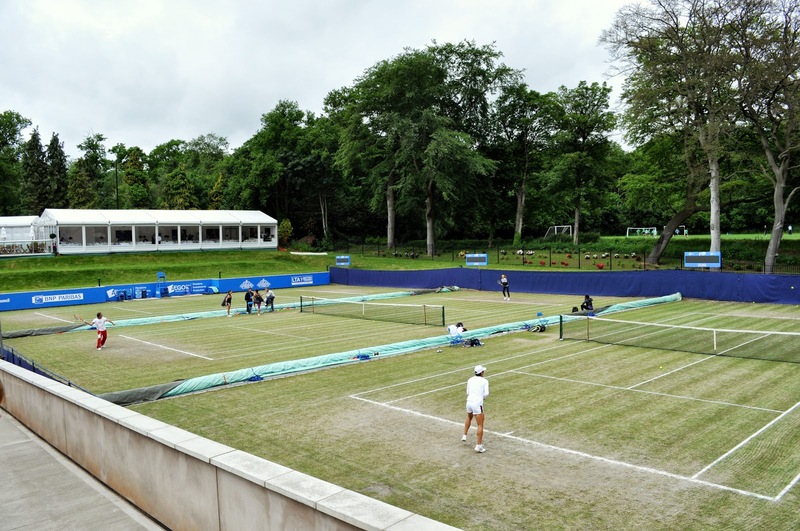 I arrived at the Edgbaston Priory Club at about 10.30am and headed straight to the match courts. There have been some considerable developments taking place here and the facilities look great. 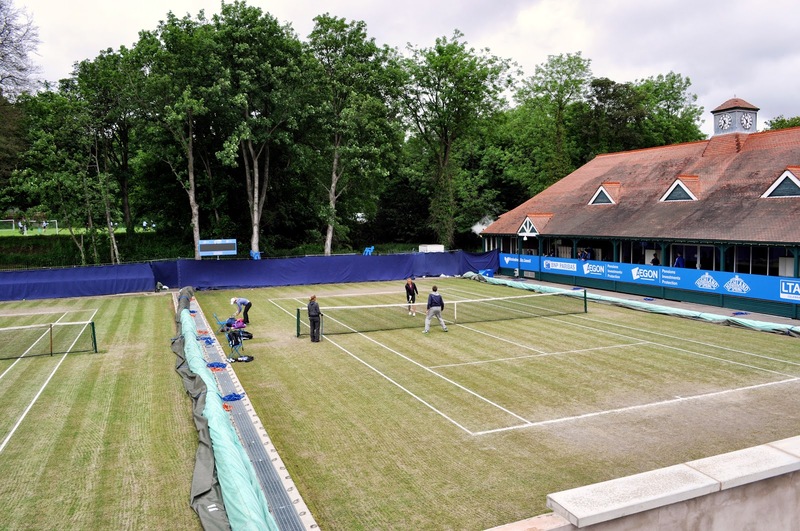 Next year the event will become a WTA Premier event and I think it is likely that when the grass court season is extended by a week in 2015, Birmingham could get the lucrative middle week. I saw Alla Kudryavtseva, Anastasia Rodionova, Daniela Hantuchova, Francesca Schiavone and Casey Dellacqua all out practising on the match courts. Last year they introduced this new raised concrete block viewing area and I have to admit I don’t like it at all. I believe you used to be able go in between the four courts, which I personally think is better. It was also lined with rubbish by the end of the day. Another gripe I had was that at the start of the day, the grounds were swarming with school children. The practice partners of Rodionova / Kudryavtseva were chucking balls into the viewing area where all the children were and they were going absolutely crazy; screaming, running and practically trampling me to the ground. I think its great that they are getting involved with tennis at a young age and I would have loved it at their age, but I cannot lie that I found it pretty annoying and the majority didn’t seem to be interested much in tennis. The rain clouds were lining up, but play began at 11am as scheduled and I stayed out on court 1 to watch the beginning of a doubles match involving Raquel Kops-Jones and Abigail Spears up against Mona Barthel and Kristina Mladenovic. I am a big fan of Mona and I had never seen her play before so I had to stick around and shoot some snaps. 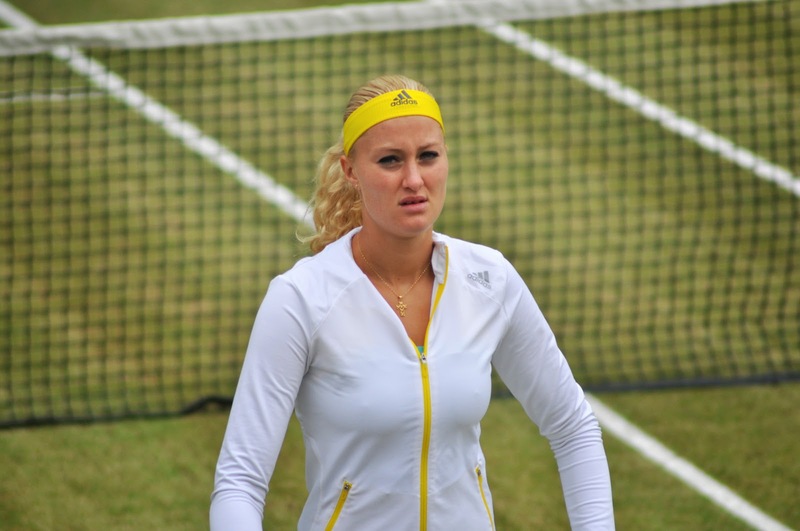 I got talking to the guy next to me who was convinced Mladenovic is going to be a top player and all that. He also said he was glad that Marion Bartoli did not show up, which made me chuckle. The only real noteworthy mention from the first five games was Mona nearly taking Kristina’s legs off with a miscued shot. The American pair aimed most of their shots to Mona and I was surprised to hear that Mona/Kristina won in the end. The drizzle became heavier and we had our first rain delay. There were about five separate rain delays in the space of 4 hours, which understandably, started to do my nut in. The court crew did a terrific job in constantly getting the courts ready to play. I headed over to my seat on the Ann Jones Centre Court for the first match of the day between Sorana Cirstea and Donna Vekic. I was really happy with my seat, which was in row B of the North Stand. The inclination of the seating meant that I was not affected by the people in front of me and I had a perfect view of the court. 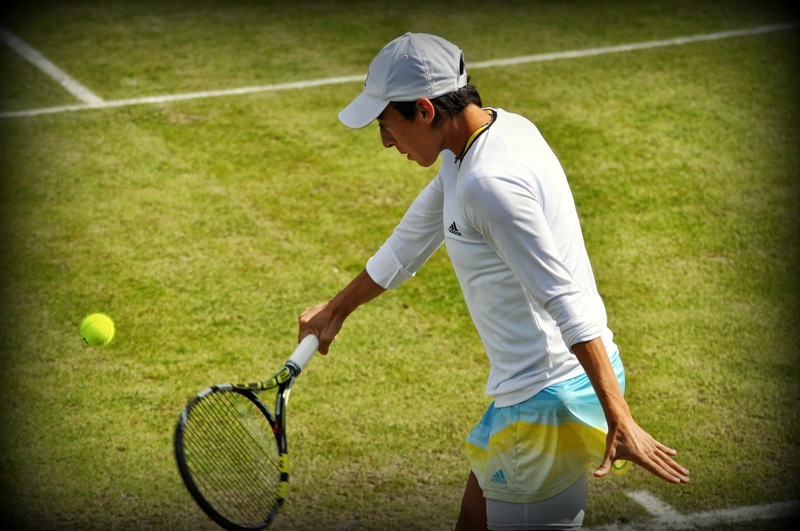 It was tough on both Cirstea and Vekic with all the delays (although I think its much tougher for the spectators! ), but it was Vekic who dealt with it much better and came out a 6-2 6-1 winner. 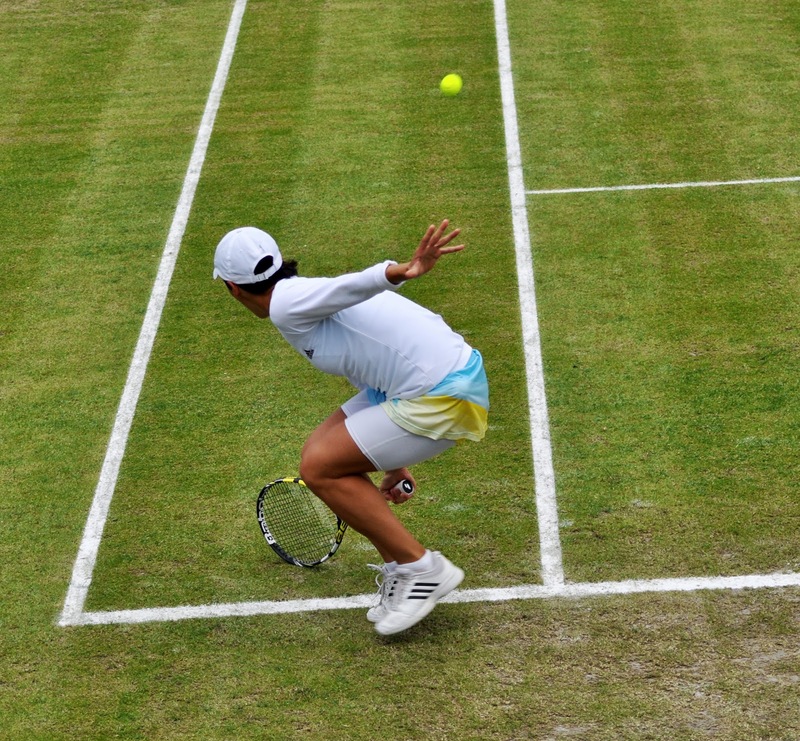 Cirstea was pretty terrible and suffered from a severe case of the serving yips; she served a string of double faults, 7 to be exact and she was matched power for power at the back of the court by Vekic, who was far the more consistent. 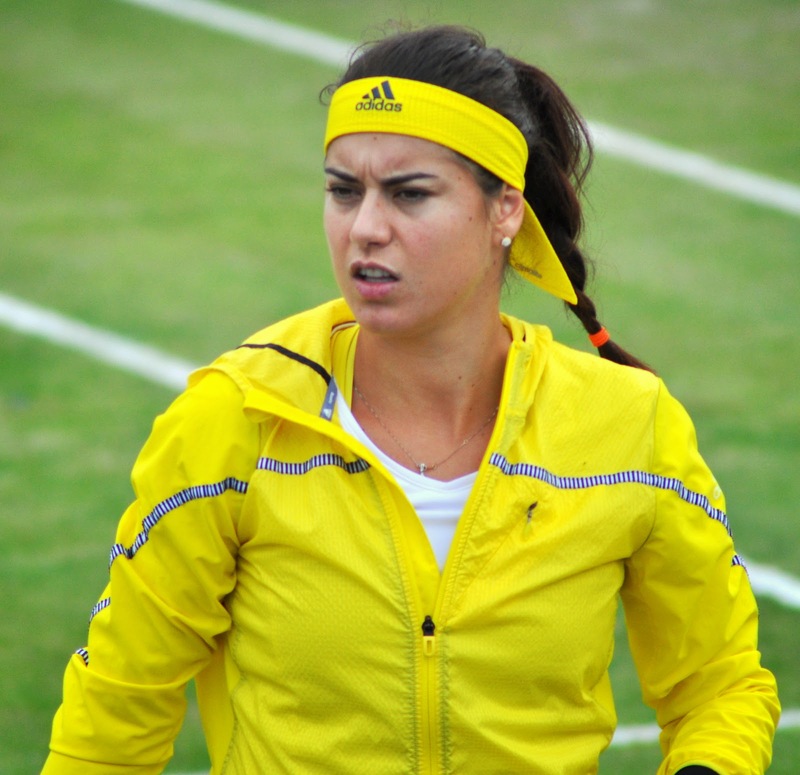 To be honest, I thought Cirstea checked out at the end. 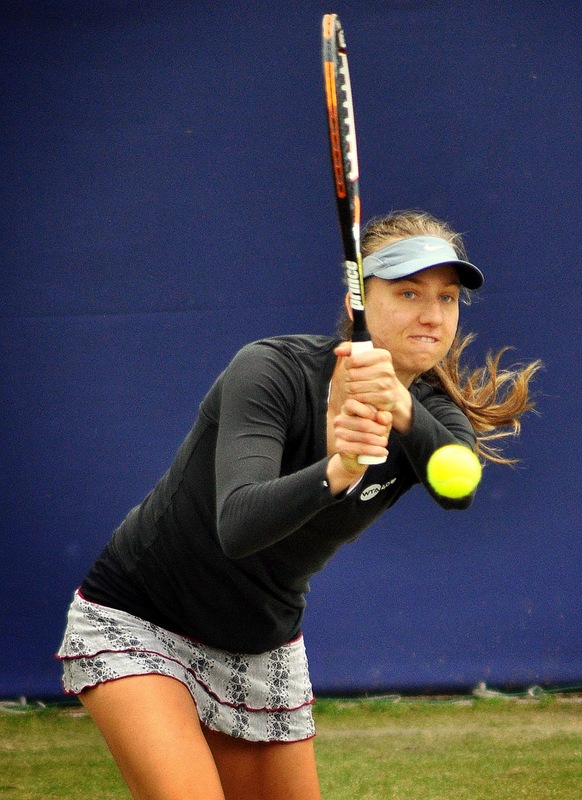 I was really impressed by the 16-year-old, Vekic who is coached by David Felgate. She has a very solid game, a good first serve (second serve needs work) and a nice way about her. She gave a good on-court interview and I think she could be a real star on the WTA tour if she keeps progressing the way she is now. Half of my pictures, Vekic had her eyes closed in! She was delighted with the win as you can imagine. After a series of on-off showers, blue skies and sunshine graced Birmingham and I didn’t have to keep checking the sky every two seconds. It was still really cold though! The second match of the day was between Daniela Hantuchova and Francesca Schiavone, which I thought would probably be the best quality of the four quarter-finals. It turned out to be a complete epic, lasting 3 hours and 22 minutes (on grass!) 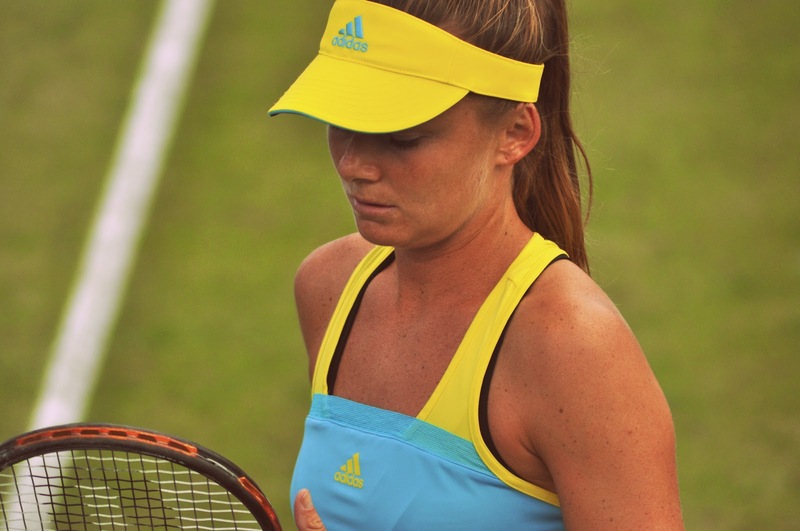 and it was Hantuchova who toughed out the win. The first set was very close as both players served really well and the play peaked in the tiebreak where the best rally of the set took place on Schiavone’s first set point. Hantuchova also nearly came undone when a shot of Schiavone’s clipped the net, but she was able to just about get it back over the net. I was trying to get a picture of Hantuchova’s head snap on her serve. This was the best I could do. Crazy yellow leggings. It was pretty cold out there! You could tell there was a great deal of respect between the two players. There were so many bad bounces on the court and the majority of them seemed to go against Schiavone, but Hantuchova was always quick to put her hand up and apologise. I thought Schiavone was terrific for the first set and a half. Hantuchova just could not get a look in on her serve and the Italian mixed up the play impeccably with an array of slices and drop shots. Schiavone was racing to victory and had break points to lead 7-6 4-0, but Hantuchova staged a rather remarkable fightback. This was a really good match. Hantuchova had a medical timeout for her ankle and then lost her cool on two very questionable line calls. 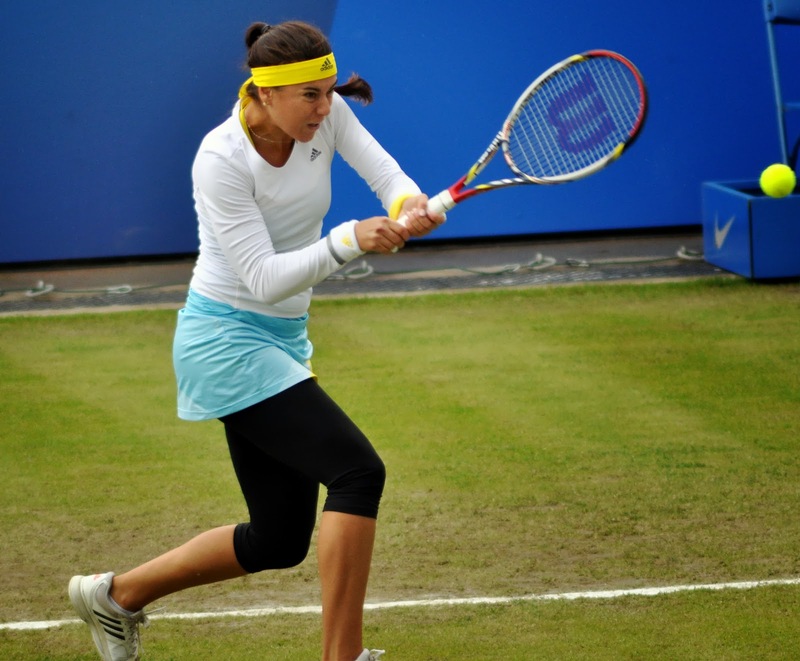 It seemed to fire her up and she started hitting more winners and overpowering Schiavone. 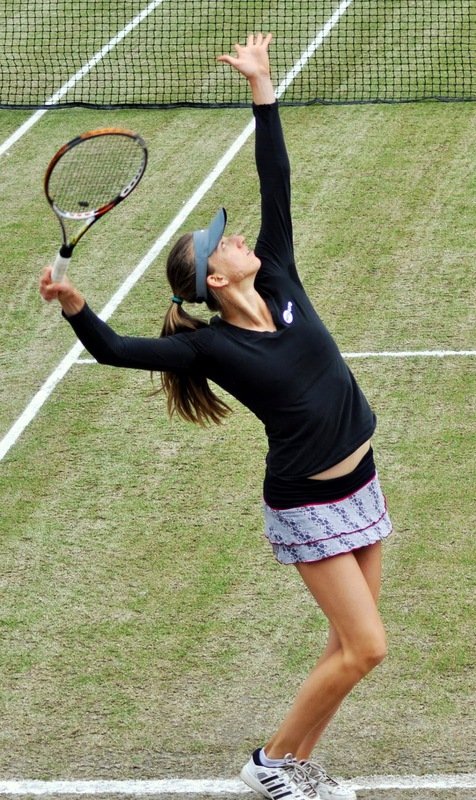 Before you knew it, Hantuchova had won five games in a row and levelled the match at one set all. Most of the games went to deuce and there really wasn’t much to call between the pair. Hantuchova ended up recovering another deficit in the third set and won the match, 6-7(8) 6-4 7-6(3), which will easily go down as the match of the tournament. 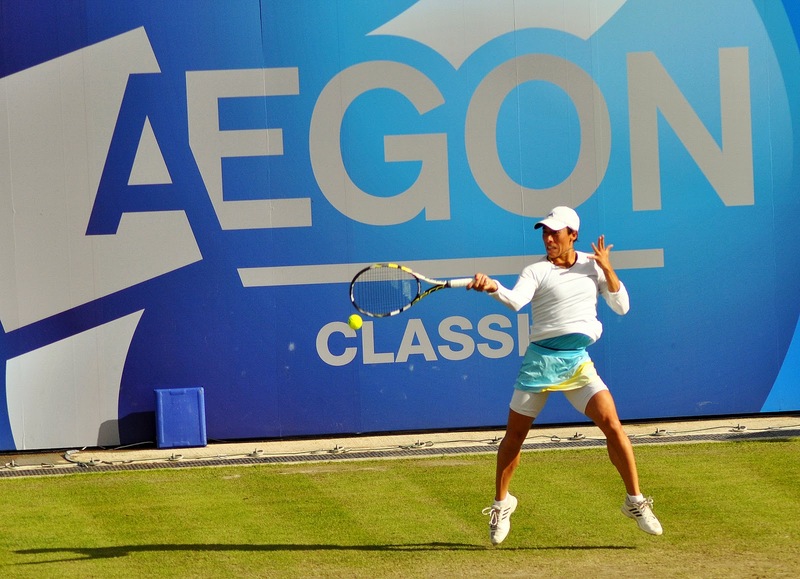 The AEGON Classic website have put together a really top video with all the key points so check it out here. Hantuchova yelled out “Are you serious” at a bad call, she was madd. When the Hantuchova-Schiavone match went into a third set, I only had 20 minutes before I needed to leave to get my train so I headed out to court 1 to catch a few games of Sabine Lisicki against Alison Riske, the fourth quarter-final that had to be moved. The match attracted a fair crowd of fans and photographers, and you could tell Sabine was one of the star attractions of the tournament. I thought it was shaping up to be a great match when I left and am not surprised that Riske ran out the winner. I hope she somehow gets into the Wimbledon draw because she could be a fearsome first opponent for some of the seeds. 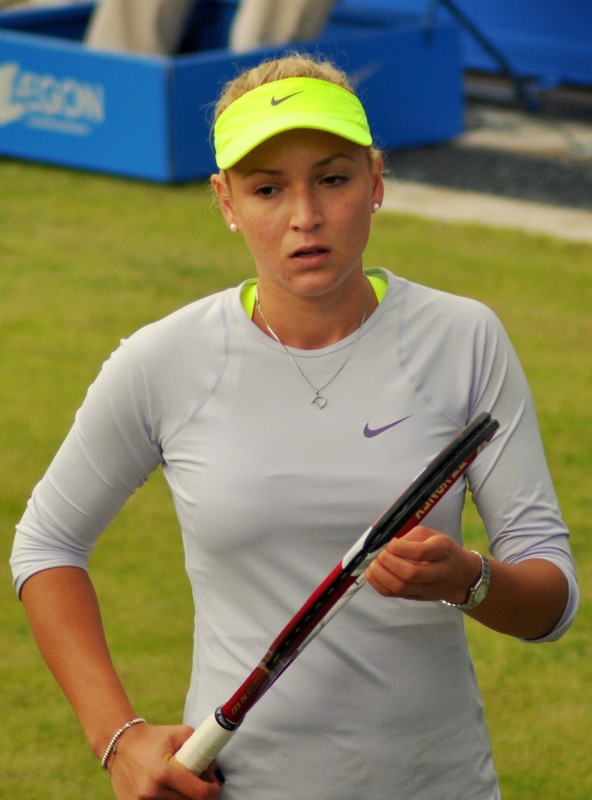 It is also worth noting that she has currently racked up ALL of her WTA main draw wins at Birmingham. 1. My top spot was watching Sabine Lisicki absolutely leg it through the rain as I found cover under the roof of the champagne bar, note without champagne! 3. 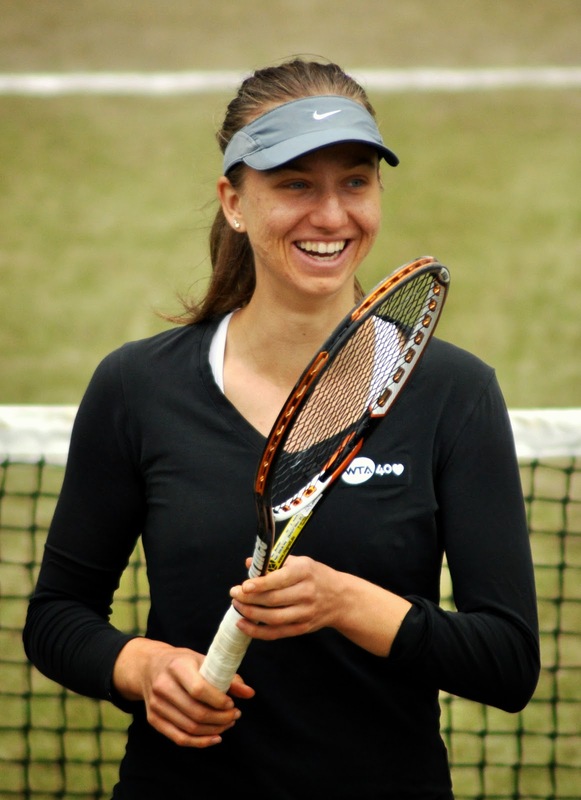 Mona Barthel‘s mum was up on the lawn by court 1 watching Mona and taking pictures with a fancy camera too. June 15, 2013 in Birmingham.